Franklin Delano Roosevelt once said that “There is nothing I love as much as a good fight.” If so, he would’ve hated where the House is headed for the next decade, because by and large it likely won’t have all that many good fights. Instead of looking at the House through the competitive races, consider instead the uncompetitive races — the large number of seats that should be safe for one party or the other for the foreseeable future. 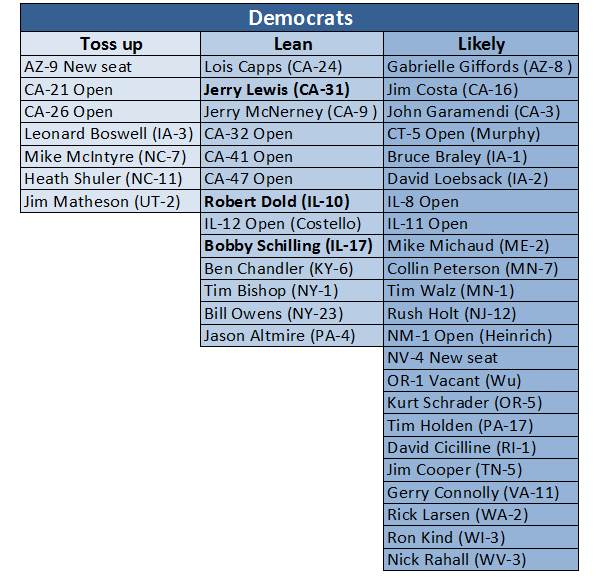 Based on the latest Crystal Ball ratings, less than one in four of the 435 House seats will be competitive next year, and if one only considers the seats we rate as “leaning” to one party or the other or as “toss-ups,” there are only 46 truly competitive contests, or about 10% of all House seats. 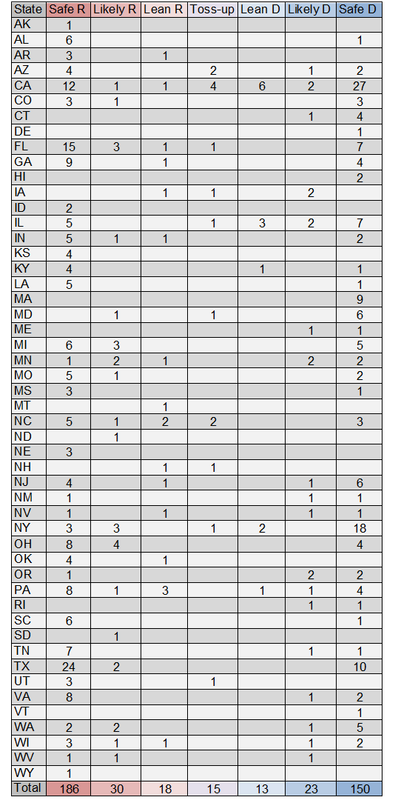 Chart 1 shows our ratings for every race in the House, listed by state. The “safe” seats on the respective Democratic (150 seats) and Republican (186) sides show where the two parties are strongest in the House looking forward to the next election and beyond. The note below the chart details some of the assumptions we made in compiling these ratings. Needless to say, this chart is subject to change as the national redistricting picture gets clearer and challengers emerge on both sides. Notes: This chart assumes that the congressional maps already passed in several states are upheld despite lawsuits and/or referendums; for instance, the Republican-passed Texas map, which is highly favorable to the GOP, might not survive a legal challenge. Likewise, a Republican map in Ohio could be put to the voters next year, which throws it into doubt. We also assume that one GOP and one Democratic seat will be eliminated in New York redistricting and that one seat apiece will be added to each party’s column in Florida. We also believe that New Jersey will eliminate one Republican seat, Pennsylvania will eliminate one Democratic seat and that new seats in Washington and Nevada will favor Democrats. None of these states mentioned have completed redistricting. As is clear from the chart, the Republicans’ House strength comes from the Southern and Great Plains states. Meanwhile, the Democrats’ safe seats come primarily from America’s major cities, the West Coast and the Northeast. 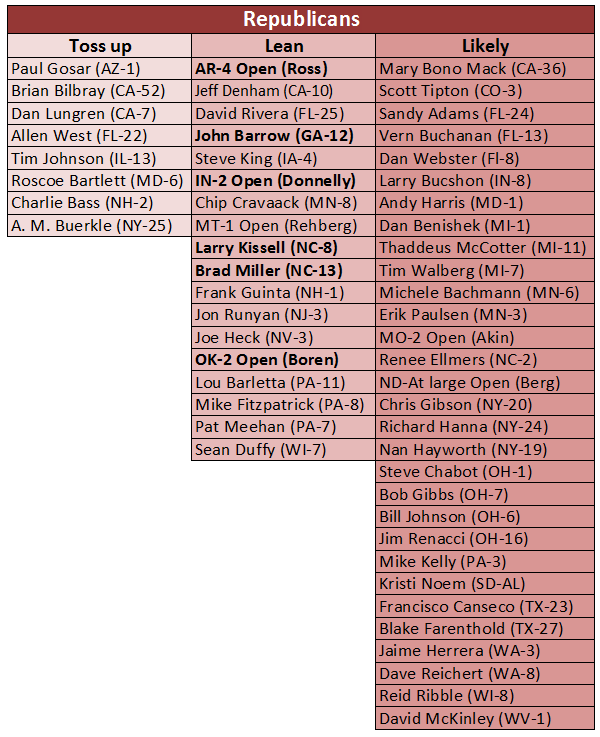 Republicans have, based on the Crystal Ball’s ratings, 186 safe seats going into the 2012 election. While some of these seats could become competitive as the election gets closer, we feel confident that they will be part of the Republican column when the 113th Congress convenes in 2013. Given the ongoing elimination of white southern Democrats, it is not surprising that close to half (91) of those safe Republican seats are in the 11 traditional southern states (AL, AR, FL, GA, LA, MS, NC, SC, TN, TX and VA). Of 138 total House seats in these states, two-thirds of them are safe territory for the Republican Party. From the South, Fort Red expands to the northwest, covering all of Kansas and Nebraska’s seven combined House seats, five of Missouri’s eight seats, four of Oklahoma’s five seats as well as Wyoming and Idaho’s three combined seats and at least three of Utah’s four seats. The inland West Coast — eastern Washington, Oregon and California, as well as parts of Arizona — is also friendly GOP territory. The GOP has 19 safe seats in those four states. Another way of looking at the GOP’s bedrock territory is to look at the 22 states John McCain won in 2008, which will have 136 members of the 435-member U.S. House come 2013. About seven of every 10 of those states’ seats (95 of 136) are safe ground for the GOP. The rest of the GOP’s safe seats primarily come from rural or suburban parts of the Midwest. While Republicans control much of the South and the Heartland, the heart of the Democrats’ power in the House — 150 seats that the Crystal Ball believes are safe for Team Blue, at least for now — is on the East and West coasts. Nearly a quarter of these seats are in California (27), Oregon (2), Washington (5) and Hawaii (2). Meanwhile, in the Northeast and down the Atlantic coast, Democrats have another 47 seats from nine states: CT, DE, MA, MD, ME, NJ, NY, RI and VT. The majority of these seats are in the Empire State (18) and the Bay State (9). For Democrats, New Hampshire sticks out like a throbbing, red thumb in the otherwise Blue Democratic Northeast — both of its House seats are held by Republicans, although both races should be competitive next year. All told, 83 of the Democrats’ safe seats, or more than half their safe total nationwide, are in these 13 coastal/Northeastern states. Unsurprisingly, these 13 states should be safe ground for President Obama next year — the Crystal Ball ranks all of them as “Safe Democratic” for the president’s reelection bid next year, with the exception of Maine and Oregon, which are likely Democratic. The rest of the safe Democratic House seats, for the most part, are located in or near the nation’s major cities or in rural areas populated by significant minority populations. A few of these safe Democratic seats are in the Republican Deep South: For example, Alabama, Louisiana, Mississippi and South Carolina have one majority-minority Democratic district apiece. These districts give minority voters the ability to elect a minority member to Congress, but they aren’t necessarily good for the Democratic Party. Those four southern states will have 24 representatives in the next House: Four almost certainly will be black Democrats; the other 20 almost certainly will be Republicans. No wonder why, in redistricting, black Democrats and white Republicans sometimes get along just fine, to the consternation of white Democrats. Other majority-minority districts are dotted across the country in places such as Chicago, St. Louis, Philadelphia, Detroit and Cleveland. These add another 10 seats, roughly, to the Democratic total. Based on the Crystal Ball’s most recent ratings, there are 336 uncompetitive House seats across the country, or about 77% of the U.S. House’s 435 seats. Obviously, these ratings can change, and different seats will become competitive as the decade moves along toward the 2020 census (and a new round of redistricting), but the overall message is clear: at best, it seems as though only one in four House races will be competitive next year or in the years to come. And that assumes that the races we’ve denoted as “likely” (the competitive House listing is at the end of this story) are actually competitive next year. That’s another 53 races (30 likely Republican seats, 23 likely Democratic seats) that might not ultimately be all that competitive. Presuming the “likely” seats are competitive, there are 99 competitive House seats right now. Precisely a third (33 of 99) are in Pennsylvania and seven Midwestern states (IA, IN, IL, MI, MN, OH and WI). Big Ten country is competitive, at least in politics if not in college football bowl games. Another 14 are in California, newly competitive after the introduction of nonpartisan redistricting. Florida and New York, which are roughly tied as the nation’s third-largest states, have 11 combined — and that’s before we know the result of redistricting in those states. And still more are dotted across the map in places as diverse as Arizona, Colorado, New Hampshire, North Carolina, Oregon and Rhode Island, to name a few. FDR’s contemporary, Winston Churchill, said that Russia was “a riddle wrapped in a mystery inside an enigma.” The Russian bear may be a riddle, but there’s nothing mysterious or enigmatic about the lion’s share of the seats in the U.S. House of Representatives — most of them should be rock-solid for one party or the other over the coming decade. Two aspects of the national House map that are true today are likely to continue over the next decade: The first is that the vast majority of the seats are uncompetitive, and the second is that a lot of those uncompetitive seats are centered in states that, on the presidential level, aren’t particularly competitive either. The United States is sorted into Team Blue and Team Red, and not just at the presidential level. Notes: Bold type indicates that the current party that holds the seat is not favored to keep it. If redistricting has been completed in a state — the California seats are a good example — incumbents have been matched to the district in which they plan to run, which in many cases is a different number than their current seat. Races not listed are either safe for the current party that holds it or are projected to be eliminated via redistricting.